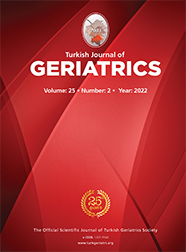 2Narlıdere Geriatric Care Center and Residential Home İzmir, Turkey DOI : 10.31086tjgeri.2018137965 Introduction: Aim of this study is to determine the frequency of nasal, axillary and rectal colonization by multidrug-resistant bacteria and the risk factors for colonization in nursing home residents. Materials and Method: In this cross-sectional study, demographic data and risk factors of the residents were recorded. Data regarding patients" independence were collected using activities of daily living form. Nasal and axillary swabs were analyzed for methicillin-resistant Staphylococcus aureus and rectal swabs for vancomycin-resistant enterococci, extendedspectrum beta-lactamase-producing Enterobacteriaceae, and carbapenemase-producing Klebsiella pneumoniae. Results: From 247 residents, 247 axillary, 246 nasal, and 245 rectal swabs were obtained. Median age was 85±6.7 and 190 (77%) residents were female. Swab samples from 75 (30%) residents yielded S. aureus, 8 (3.2%) of which were methicillin-resistant. Of the residents, 10 (4.1%) vancomycin-resistant enterococci, 17 (6.9%) extended-spectrum beta-lactamase-- producing Enterobacteriaceae, one (0.4%) carbapenemase-producing K. pneumoniae were found. Colonization with more than one type of multidrug-resistant bacteria was found in 3 (1.2%) residents. Colonization rates of multidrug-resistant bacteria were 2.7 times higher with antibiotic use in the last month and 3.1 times with immobility and enteral support. Colonization rate of multidrug-resistant bacteria increased with higher activities of daily living scores (p=0.004).